Up to four players can build together. 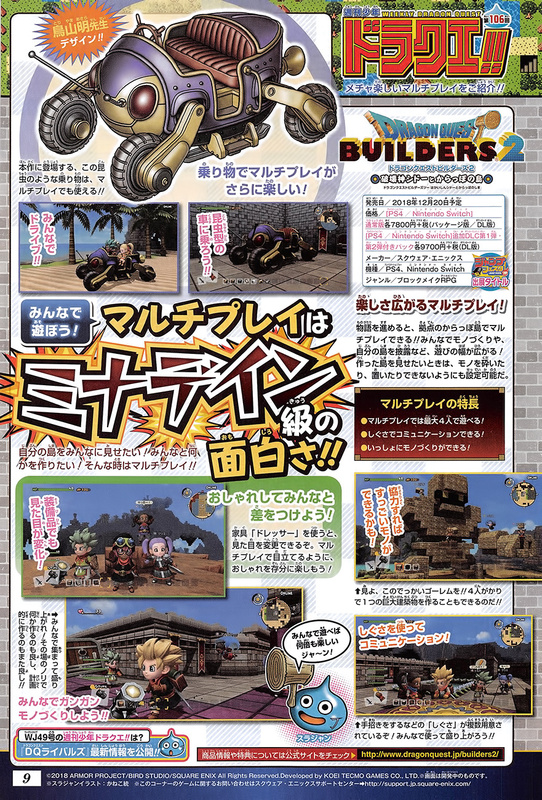 The latest issue of Weekly Jump has new information on Dragon Quest Builders 2‘s multiplayer component. Enjoy multiplayer even more with your vehicle. The bug-like vehicle that appears in the main game can also be used in multiplayer with friends. Drive around with everyone inside! A maximum of four players can play together in multiplayer. Using the “dresser” furniture, you can change your appearance. Stand out in multiplayer and enjoy dressing up to your heart’s content. Even equipment changes your appearance. Gather everyone up and get psyched. Build whatever comes to mind in the spur of the moment, or develop a plan and build something. Look at this huge golem (pictured in the magazine)! The power of four people working together can create even something as big as this. Several gestures, like beckoning, are available for use in multiplayer. Dragon Quest Builders 2 is due out for PlayStation 4 and Switch on December 20 in Japan.